Exactly two years ago, a tragic event happened in Palawan that impacted Tutubi's life and outlook in this world particularly in his living on the edge attitude. On the second day of Tutubi and his friends' travel in Puerto Princesa, Palawan, the huge white cross of Iwahig Penal Colony, a wall-less prison where prisoners till the land instead of being kept in cells, was the silent witness of a tragedy that's about to happen. 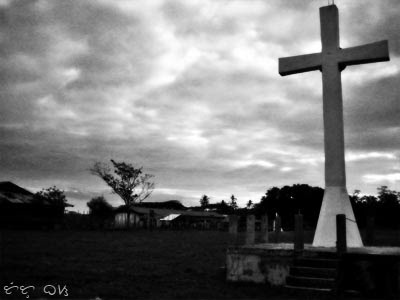 The large cross of Iwahig Penal Colony near the maximum security compound (a rather crude attempt on high key effect using Photoshop). It was on a beach near Iwahig, a place called Inagawan, where Tutubi and two of his travel mates survived unassuming yet dangerous waves on an underwater cliff; one of his friends didn't make it alive. May you rest in peace, Rolan! i somehow know your sentiments tutubi because we've lost a mountaineer-friend almost 2 years ago. up to now, it seems unreal but it happened. it somehow made me extra cautious but hopefully it didn't make me scared. aw.. sorry to hear about that. Traveling must be really dangerous sometimes.. Take care everyday. we all learn from mistakes. others don't but they remember. but hey, you're doing something that you love to do, travelling. I'm sorry to hear about that tragic event. Sorry to hear that tragic event. Man, you can never trust places that look so inviting and beautiful. We always have to be extremely cautious anywhere we go. it's been two years, but condolences on the loss of your friend. i am sorry to hear about this. it is not easy to forget but time will heal the wound. Must be terrible to loose a buddy like that. Nature can be so cruel. Time flies so fast (this year is Rolan's 5th ann. to heaven) but I still got teary-eyed while I read again your blog and the uplifting comments of the readers. I'm sure Rolan is now very happy and peaceful with our Lord. May the soul of Rolan rests in peace, AMEN.